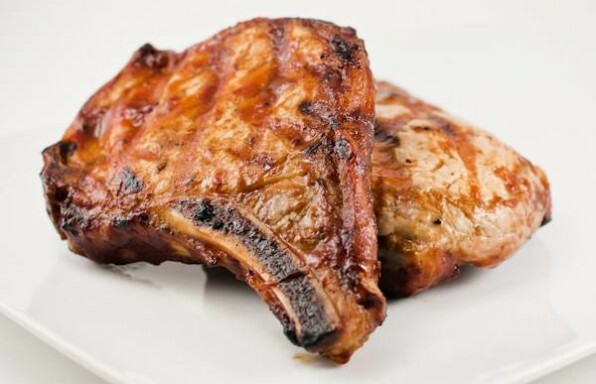 Whenever I grill a T-Bone steak, I always seem to think of Fred Flintstone. Not sure why. Just happens. 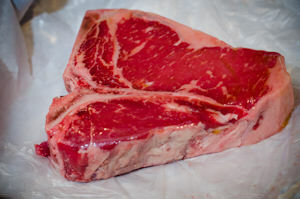 Anyway, the T-Bone is part strip steak, part tenderloin. Not bad, eh? According to the USDA, if the filet part gets bigger than 1.25 inches when measured parallel to the bone, then it is a porterhouse. But porterhouse is a different post. Grilling a T-Bone is like many other steak recipes on our site: you can get fancy if you want, but when it comes to steak, simple is really good. Choose a well marbled cut, and thick. 1 inch or more preferred. 1Remove the steak from the refrigerator and let it warm up towards room temp. About 20 minutes while you prep the grill. This will let you get a good sear on the steak and get the inside cooked just perfect. 2Trim any excess fat from the outside edge of the steak. This fat won't add flavor and will only lead to flare-ups on the grill. 3Prepare the grill with a 2 zones: high and medium-low heat. For charcoal, that is 2 to 3 coals thick for the high zone, and 1 layer of coals for medium. Clean and oil the grate. 4Sprinkle a good amount of salt and a decent amount of ground pepper on the steak. 5Place the steak on the hottest part of the grill (on the grate, of course). 6Grill until you get a good sear. This depends on your grill, but probably about 2 to 3 minutes. If you get any flare ups that last for longer than a few seconds, move the steak to a different part of the hot grill until the fire dies down. 7Flip it, grill for 2 minutes then check your temp. Remove at 125° F to 130° F for medium rare. Use a good thermometer to check. 8If your steak is extra thick, the outside may be seared, while the inside is still not up to temp. Move to the steak to the medium low side of the grill and finish it off there until it comes up to temp. If you have to cook for more than 2 minutes, flip it until it is done. 9Once you pull the steak from the grill, let it rest for about 5 to 10 minutes. The temp will rise a few degrees. For other doneness temps, you can download our free MeatTemps app for iPhone. cut you r time in half if you have a steak that is less than 1 – 1 1/2-inch think. and flip once. two flips and you may end up with shoe leather. This was my first attempt at grilling anything on my gas grill. I followed institutions and used a light olive oil coat on the grill. I was very pleased how my T-bones came out. NEVER NEVER NEVER “flip a steak more than once. Ya can move it over to get the grill marks but don’t turn it “over & over”.